At a recent card show a seller had a bunch of back issues of Beckett Baseball Card Monthly and amongst them was the first issue of Beckett that I ever purchased. 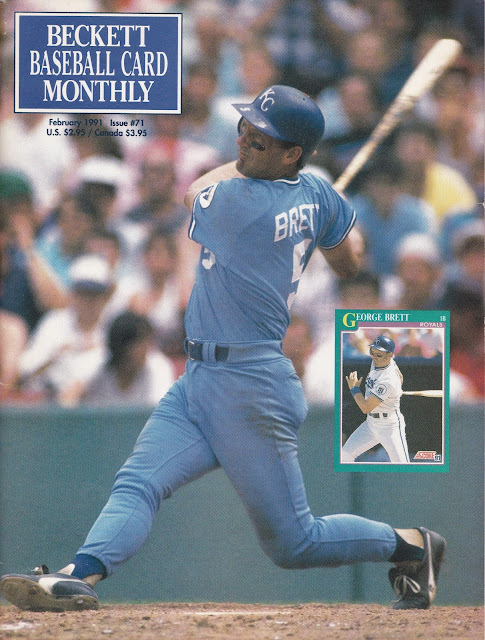 It was the February 1991 issue that features a beautiful shot of George Brett swinging and his turquoise 1991 Score card. 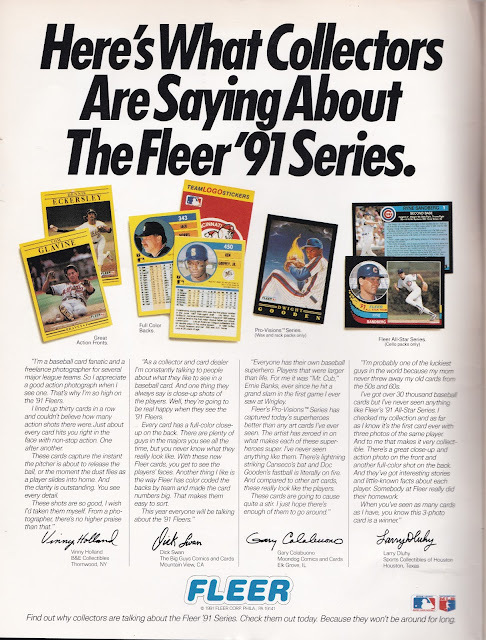 There were so many great memories inside like full page ads for the infamous yellow border 1991 Fleer set with testimonials from local cards shops about how great the set is going to be. 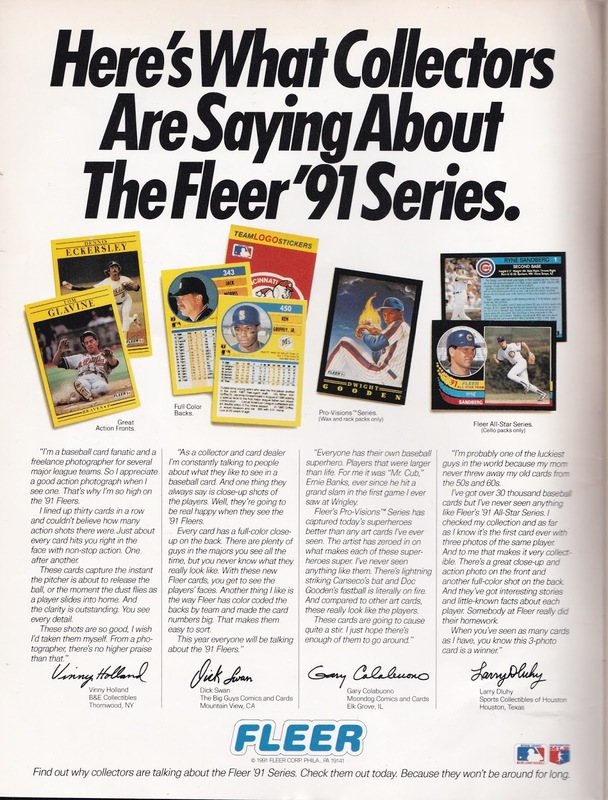 It includes this remarkable quote from Gary Colabuono, owner of Moondog Comics and Cards, who states "I just hope there's enough of them (1991 Fleer cards) to go around." 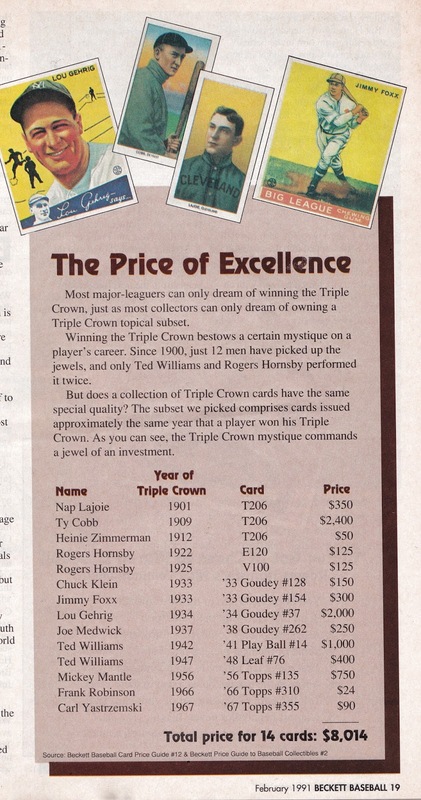 A small article also details some key cards for Triple Crown winners with prices that collectors would drool over today. 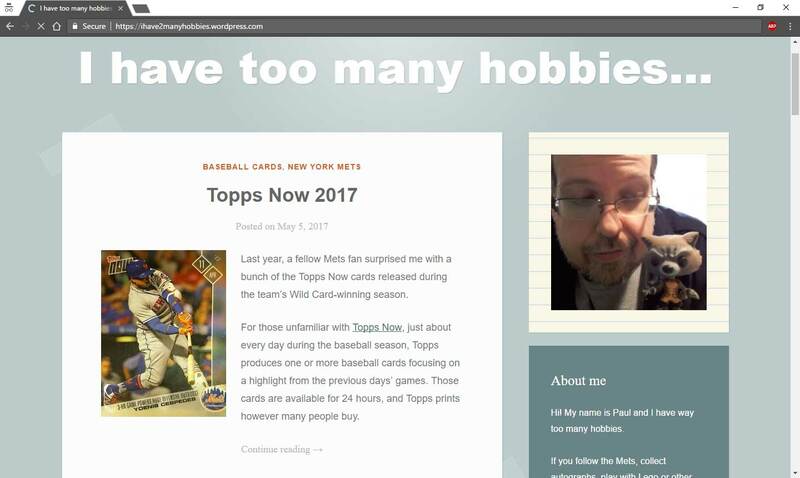 For example, Nap Lajoie's T206 can top $2,000 today at auction, Rogers Hornsby's E120 American Caramel goes for over $500, and Mickey Mantle's 1956 Topps can top $3,000 for near-mint graded versions. 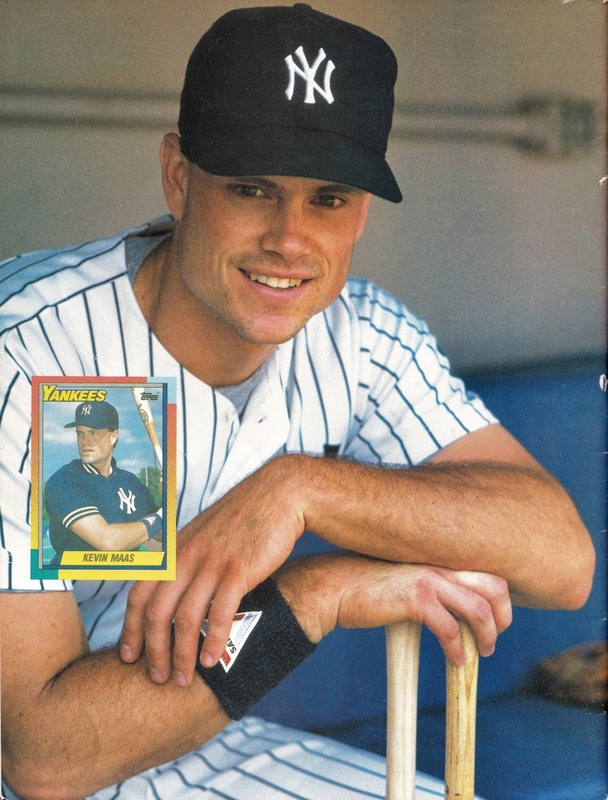 I always loved the Hot and Cold list as it gives an interesting snapshot of the moment and how wrong collectors were in the short term...like David Justice at #2. Jose Canseco is #10 on the Hot list and #2 on the Cold list and I think that is pretty accurate with how collectors feel about him today with both intense love and hatred. The advertisement section is get. 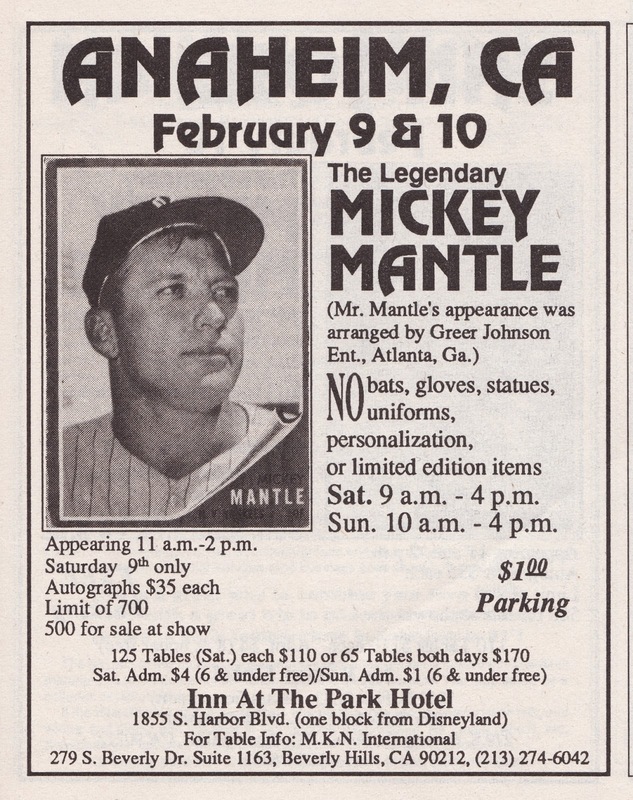 You could have gotten Mickey Mantle autographs for $35 each in Anaheim, California. 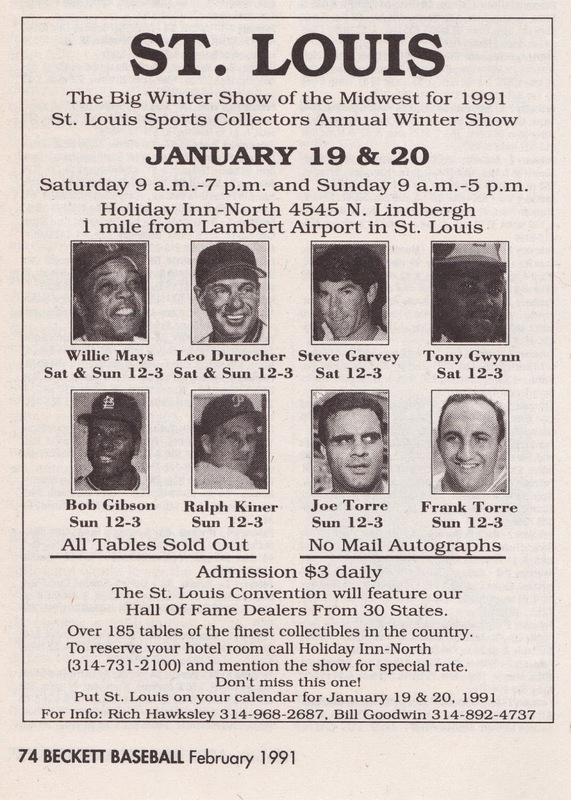 And if you weren't in St. Louis at the Big Winter Show of the Midwest on January 19th or 20th, 1991 then you were wasting your life! You have seen Willie Mays, Tony Gwynn, Bob Gibson, Leo Durocher, and Ralph Kiner. If you don't remember, Beckett would include a sort of poster shot on the back cover and this month's photo was of Yankees megastar-at-the-time Kevin Maas with his 1990 Topps Traded card...that might be even the Tiffany version. love flipping through my old beckett magazine. the hot and cold list is definitely a great marker of the times...kinda like when my grandparents would tell me how much milk used to cost. Last weekend, I dumped a few hundred Becketts and Tuff Stuff magazines that I had been saving for years. 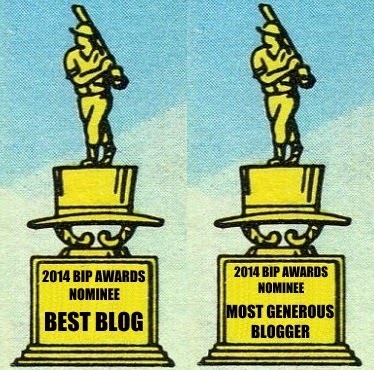 I spent a few hours flipping through them. 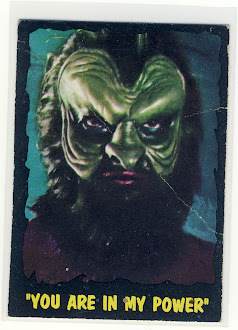 I kept about 20 issues that had interesting articles and ripped off the covers of guys I collect. I figured it would be cool to one day flip through them, but I never got around to doing it. My favorite part of Beckett in the late 80's/early 90's were checking out the Hot/Cold lists. Gotta wonder why so many collectors hated Sportflics. I loved them.